All our websites include a free .co.uk domain name subject to availability, registered for two years, but if you would prefer another suffix (.com or .co for example) these are available, subject to availability, from £15 registered for one year. Website hosting is included for 1 year in the Starter Package only. All other web hosting prices are first year costs only. At Cyber Team we provide affordable brochure style website solutions for small businesses and the sites we produce are all customised and unique to you. You will find that we are honest and upfront with our pricing and have no hidden or extra costs. We also have a very simple pricing structure which will ease your task of budgeting and there are NO set up fees. Our single page website packages may be just one page but they are comprised of several sections that can be automatically scrolled to simply by a click of the navigation menu. This means that your entire website is placed onto a single page and takes up far fewer resources than a standard multi-page website. Smooth, quick, easy and before you know it your website's taking on the big boys - Now that's SMART! 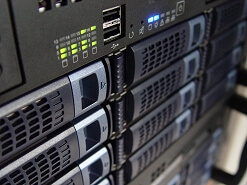 High quality and UK based hosting comes as standard for your website. The resources that we use are based and built on the latest server and hardware technology available providing robust but affordable web hosting. This means that your website will have maximum uptime coupled with the power and reliability that your business requires. You are safe in the knowledge that these servers are constantly monitored to make certain that your website is up and running with the best performance possible.